Construction of Hirshhorn Museum and Sculpture Garden, 1972, by Harry B. Neufeld. Smithsonian Institution Archives, Acc. no. 11-009- Smithsonian Photographic Services, Photographic Collection, 1971-2006, Image no. 72-10862. Though the Hirshhorn Museum and Sculpture Garden currently sits next to the Arts and Industries Building, Joseph and Olga Hirshhorn spent years finding the ideal location. The creator of the Hirshhorn’s collection, Joseph Hirshhorn, traveled with his wife Olga Hirshhorn around the world looking for a place to put their collection that had been overwhelming their homes in Connecticut, California, New York, and Florida. According to Olga Hirshhorn in her oral history interviews, before she met her husband in 1961, he believed he could make his spacious home in Greenwich, Connecticut a museum. While the outer garden, with its fresh grass and expansive sculpture garden, worked well for tours, the neighborhood’s tight security was restrictive to guests, and the short walls made displaying large pieces difficult. Mr. Hirshhorn thought better of the idea once Mrs. Hirshhorn convinced him it could not work. In 1963, Hirshhorn took a trip to Florence, Italy, to explore the possibility of having a museum there, meeting with Mayor Giorgio La Pira. Yet the fifteen percent duty that would be placed on each piece coming into the country was too costly for the collector. Traveling next to Zürich, Switzerland, Joseph Hirshhorn sat for a bust by Marino Marini and met the mayor of Zürich. Although a museum there seemed intriguing, Hirshhorn was dissuaded when the Swiss planners hinted their intentions to sell the large number of Alberto Giacometti pieces Hirshhorn possessed. 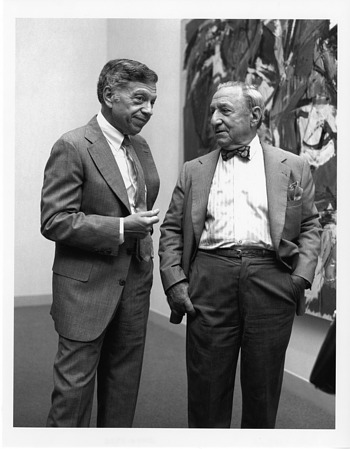 As a collector who rarely sold his pieces, Hirshhorn determined the location was not a viable option for his museum. After they bought a house in La Quinta, California, in 1964, the couple debated founding a museum in Beverly Hills at the Greystone Mansion. But when the owner wanted Joseph Hirshhorn to buy the building instead of merely donating the collection, the couple became disinterested. After their wedding in 1964, the Hirshhorns stopped in London, England on their way to their home in the French Riviera. There, Lord Perth offered their collection a spot in Regent's Park. Plans were drawn up for the museum and it seemed a viable option. Joseph Hirshhorn, a man who came from a poor background, was astonished that his collection could sit in such a renowned area, and the location became a top choice. On that same honeymoon, the couple took a trip to Israel where Hirshhorn contemplated establishing a museum for his collection there. Noting its distance from the United States and its limited audience, he decided it was not an option. However, Hirshhorn managed to convince his close friend Billy Rose to donate his collection to Israel, establishing the Billy Rose Art Garden. 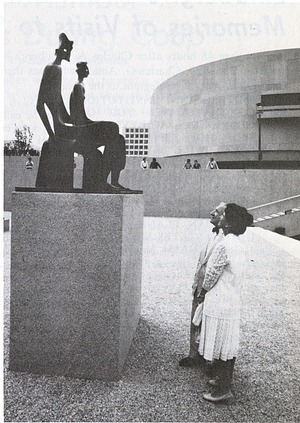 At that time, Hirshhorn had been offered multiple locations to display his artwork in New York. Nelson Rockefeller made a persuasive case for Purchase, New York. In addition, the 1964 World’s Fair grounds and the Astor Library were offered but ultimately not accepted. At this point, galleries around the world were competing to obtain the Hirshhorn collection. When meeting with the Hirshhorns at their home in Greenwich, Director of the Kennedy Center for the Performing Arts Roger Stevens suggested Washington, D.C., for the museum. 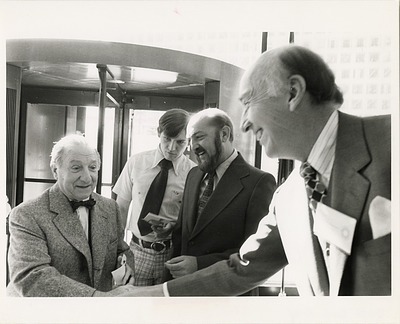 Together, Smithsonian Secretary S. Dillon Ripley, assisted by President Lyndon Johnson and Lady Bird Johnson, convinced Joseph Hirshhorn to give his collection to the Smithsonian and put major funding into the sixteen-million-dollar building. Planning for the Hirshhorn Museum and Sculpture Garden was soon underway, and the groundbreaking ceremony took place in 1969. Though there were several locations proposed for the museum, it eventually found its home on the National Mall, opening on October 4, 1974.